Current construction trends towards curb mounting of packaged air conditioners with integrated DX cooling require more attention to vibration and noise control particularly in the downflow configuration preferred by many designers to eliminate ductwork outside the building envelope. In addition to attenuation of fan noise and structure-borne vibration, it is now necessary address radiated noise under the unit inside the curb, breakout noise in the critical first elbows inside the building, as well as flanking noise leaks where the downflow ducts penetrate the roof deck. Integrated single source specifications are needed to effectively address this multi-path application. 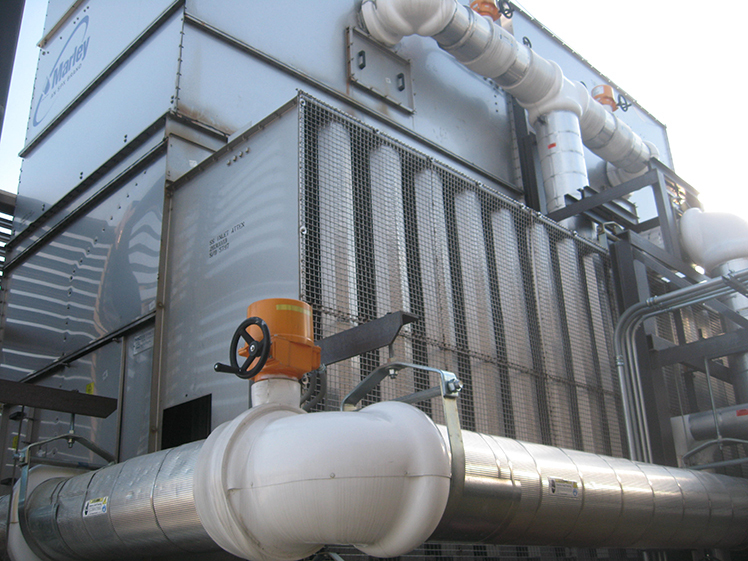 Refrigeration chillers are comprised of a condensing unit with compressor circuits. The most frequently specified chiller models utilize screw compressors which emit pure tones that are annoying to the human ear. Well-designed noise control treatments must consider targeted overall broadband levels required but cannot overlook the subjective expectations of building occupants and the community. Fan coil units, fan powered VAV units, water source heat pumps and other terminal unit equipment are best located in ceiling plenums above corridors and other non-noise sensitive utility spaces. When terminal units are used in ceiling plenums above noise sensitive spaces less than NC-40, attenuation strategies to mitigate cabinet radiated noise and in-duct fan/air noise become critical. Architectural trending towards “industrial chic” designs of large open spaces with exposed/open ceiling decks is putting a higher premium on acoustical treatment of terminal units and other ceiling suspended mechanical equipment. 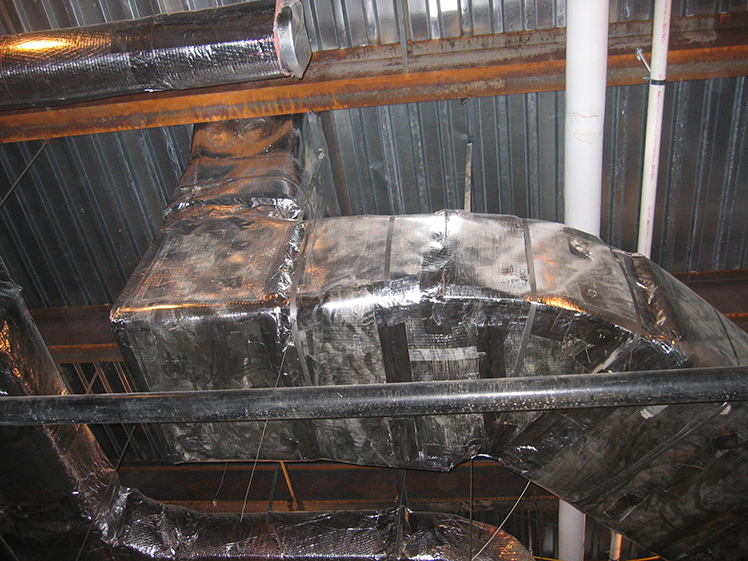 Duct design and layouts should follow the recommendations of SMACNA and ASHRAE design handbooks. Avoiding abrupt take-offs, turns and changes in duct cross sectional area/aspect ratio can control regenerated noise associated with air turbulence when laminar airflow is disturbed or interrupted. Controlling duct velocities in the system is also important especially as NC target levels decrease. 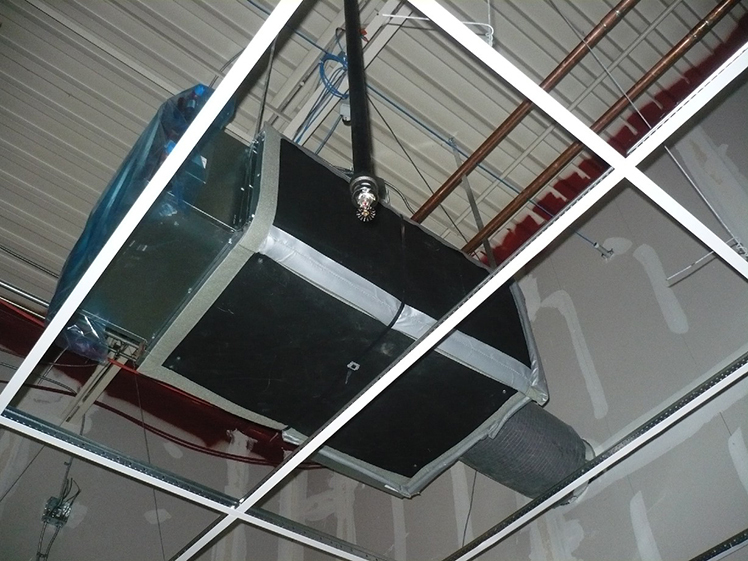 A variety of HUSHCORE™ solutions exist to control in-duct noise transmission to and from room diffusers and to mitigate duct breakout noise radiating through the plenum and ceiling to occupied spaces below overhead duct runs. HUSHCORE™ acoustical duct liners are non-fiberglass, fire-rated, Class “A” cellular acoustical foams with no respirable fibers exposed to the airstream. Most HUSH DUCT™ silencers are available in optional sanitary hospital grade media protected construction or designs that are packless/fiber-free. Click here to access “Best Practices” tips for a wide variety of mechanical equipment applications and systems. These bullet summary recommendations reflect industry accepted standards that are consistent with guidelines outlined in the current edition of the ASHRAE handbooks. Consult BRD for project specific input that may be needed to amend these recommendations. Early design review allows for needed dialogue between mechanical and other design trades. Early design review also allows for intelligent budgeting dialogue so that acoustical scope does not fall victim to post bid value engineering deletions by contractors with little experience in predicting the impact of such VE decisions. 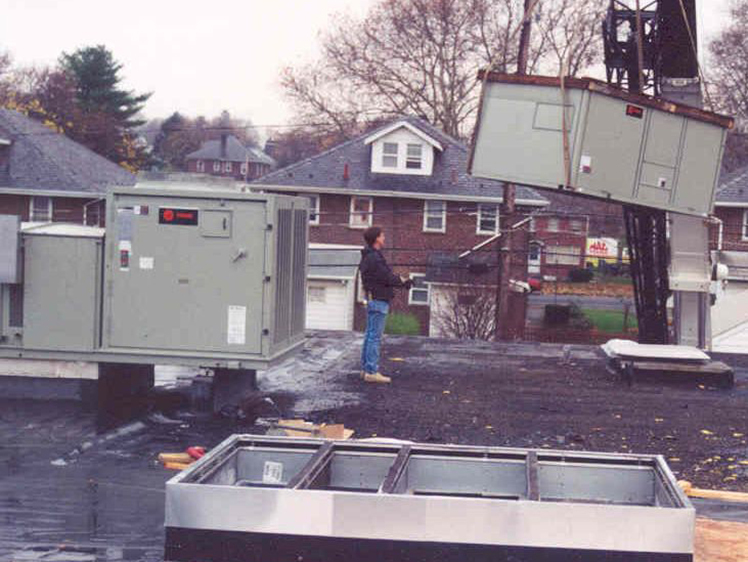 Equipment screening can be used as an architectural element to “hide” unsightly roof mounted mechanical units or for controlling outdoor sound radiation to adjacent spaces or properties. Sometimes both considerations are at play. 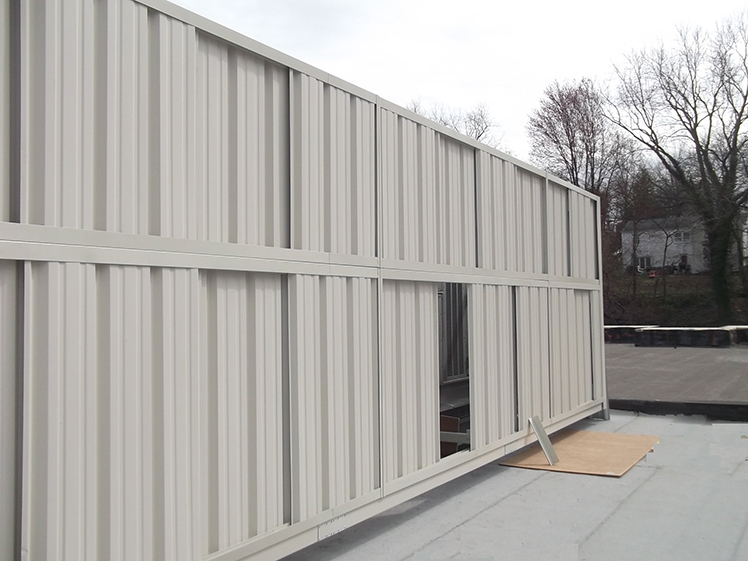 HUSHCORE™ equipment screens are mounted or supported by the unit curbs, steel or platforms and do not require roof penetrations or tie-in to building roof steel members. The Screen™ System can provide up to about 40” of clearance around the equipment. Height limitations with a single panel system are about 6’. Two tier screen enclosures can go as high as about 9’. There are several panel profile options and a large variety of color choices as well. 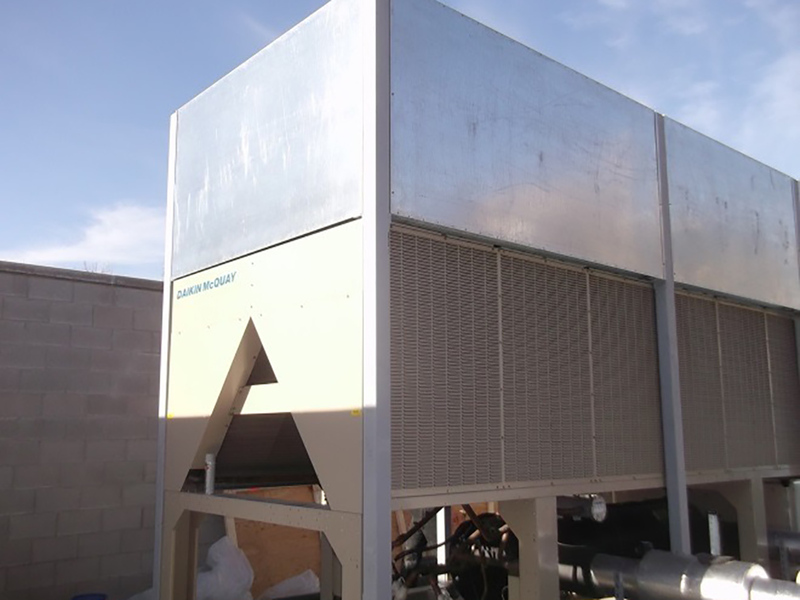 The HUSHCORE™ Screen™ System is an ideal cost-effective screening solution with optional acoustical styles for rooftop units, condensers, chillers and fans.